Forest Home Media intern Elizabeth (Lizzy) Tennessee Davis, Junior/Communications at University of Tennessee, Knoxville, Tennessee, also contributed to this post. Forest Home Media in April went to Nashville’s Country Living Fair, in Lebanon. We so appreciate Country Living magazine for partnering with Forest Home Media in hosting the Nashville Influencers, homelifestyle media and blogger group, at this awesome event. They joined us for a Periscope live stream interview with Forest Home Media Partner, Nancy McNulty. Here’s an excerpt from that interview. 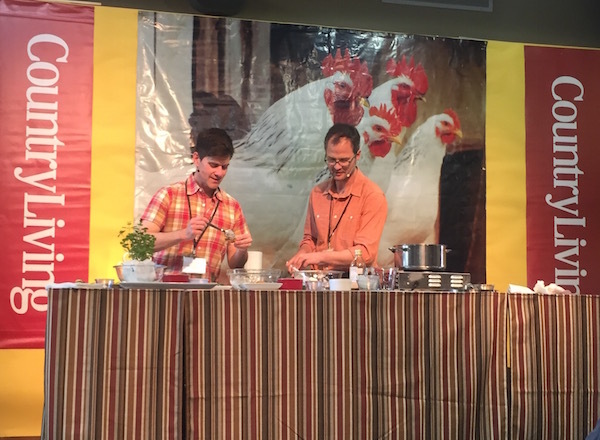 Brent Ridge and Josh Kilmer-Purcell prepare a delicious bruschetta from their cookbook at the Country Living Fair outside the Nashville area in April. So what are you doing at the Country Living Fair? Josh: Well we come to every Country Living Fair. Today we are doing a cooking demo. This time it’s three exciting ways you can make bruschetta. What is great about your recipe? Josh: This recipe is very easy and tasty. Brent: Most of the recipes from the book are very garden oriented and garden season is coming up. You can look up what you can make from you garden and the book will give you recipes for that item. Do you all have a garden? Brent: Yes we do! We grow about 80% of what we eat. Tell us about you and Country Living. Do you have a contract with them? Brent: No we just love them. They have been so good to us. We are excited about September because our first design book is coming out with Country Living. Brent: Yes we have been here before. We love Nashville! Josh: Yes we love it! What is your favorite thing about Country Living Magazine? Brent: You know it just speaks to everything we are interested in. Like the types of food and décor they feature. Has Country Living come to your house before in New York? Brent: Oh yes! It was 2010. Josh: We were the holiday cover, the Christmas issue. Brent: I think it’s still on their website. Josh: They do great things with our cookbook. A lot of the recipes are in the back of issues. You’ve got a design book coming out in September? Brent: Yes it’s called Beekman 1802 style the attraction of opposites. Brent: It will premiere at the Country Living Fair in Columbus Ohio. I have been to your store in Sharon Springs New York and I love it! Are you coming out with any new products soon? Brent: We have launched a new furniture collection, Beekman 1802. So tell me a little about your drizzle – my personal fav! Josh: The fig and elderberry drizzle is one of our biggest sellers. People love it. I’ve always loved it, but people seem to be obsessed with it. Brent: Yes, you can drizzle it over cheese, salad, fruit, or almost anything. How do people get your things? Josh: Beekman1802.com, which has everything. You can also get our pasta sauces at Target, and 25% of the profit goes back to small farms. Can you tell us more about yourselves? Josh: We still have our show on the Cooking Channel, and well we were two city guys who learned how to become farmers. Brent: Yeah, I was a physician before and then I went back to business school. I also worked with Martha Stewart. The duo has a beautiful Instagram for which Josh says they personally maintain and curate content. (#impressive) For more of our adventures at the Country Living Fair check out our interview with Country Living Editor Rachel Hardage Barrett! And, to learn more about the Fabulous Beekman Boys, click on the links throughout the story. Next up for Forest Home Media, we help launch Music City’s newest signature home event, the Nashville Symphony Show House. We are hosting over 50 home regional and Nashville area lifestyle bloggers and media throughout the event. Visit Castle Homes website for more info and find out about this home tour which is being called music to the eyes! If you want to join us at this week’s media/blogger sneak peek & garden party on Wednesday, June 10, the Nashville Influencers will be there! We have a few spots left. Carmen Johnston Gardens and PBS/NPT Volunteer Gardener Troy Marden will be joining us as well as the amazing home’s design and building team. The iconic Miss Daisy King will be creating a delicious garden party. Email [email protected] for more info and connect with us socially!